For The Book of Darkness & Light, the auditorium of the Camden People's Theatre is bare and semi-dark. Centre stage, a wooden crate is standing upright and serves as a coffee table for a pewter tankard and three artificial candles. These emanate a pulsing orange glow, strong enough for me to see the violin laying on the floor. On the other side of the crate, there's an empty chair. 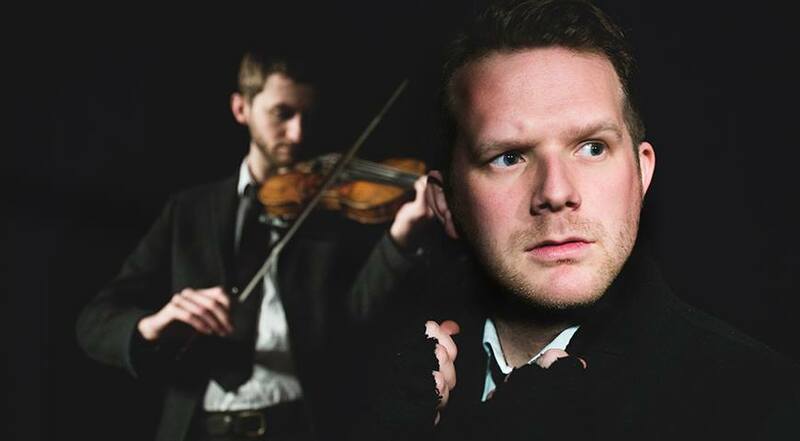 First to walk onto the stage is Ben Styles, whose accompaniment at the violin is the undiscussed highlight of this 60-minute ghost stories showcase. Like a lament, his first note echoes from wall to wall, tearing the silence before drowning in darkness. A second longer note floats in the space like a slow cry, sending chills down my spine. When the door opens again, another man slowly walks in, holding a lantern high up and inspecting, one by one, the spectators sat on the front row. He's wearing a black suit, with a white shirt and a black tie, his overcoat is also black, but his scarf is red, and his shoes are brown. For a second, I get distracted by this detail and I start wondering about the odd choice. When playwright and performer Adam Z. Robinson starts speaking, his whole body is enveloped in a burnt orange glare, as if the whole room were candlelit. This is just an example of Aly Howe's amazing talent in recreating the mood of the scene with the lighting's changing temperature, which is often more effective than the actual words. All three ghostly tales on offer are suitably crafted to follow the late Victorian fashion. The first has as an elderly member of the Parliament as a protagonist, who suffers the consequences of his selfish politics. The second celebrates a dancing little girl, victim of a ruthless and envious step-mother. Whereas the last and most gothic anecdote is set in the 50s and recounts, through the letters of an historian to his friend, some sinister encounters with a mysterious young boy. 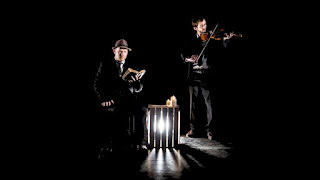 Featuring one of the village lock-up buildings that were in use during the 18th and 19th centuries, the account relies on recorded voices and disturbing tricks to unsettle the audience. Arguably, though, is the very use of these theatrical devices which affected my engagement with the story, reminding me of the artificial and performative nature of the experience. The production is littered with small discrepancies that repeatedly diverted my attention from the narration, like Robinson inexplicably wearing a headset microphone that was never used. What I found really lacking in The Book of Darkness & Light, though, was the presence of exact descriptions that is vital to the genre. Keeping the language as concrete as possible, what I really wanted to hear is, not only what the character saw or did, but also what being in that situation felt like in terms of perception and feelings. These details are what I'd have certainly related to and what would have helped me to suspend the disbelief and plunge under the skin of each character. Without giving too much away, I didn't need a visual input or a recorded sound effect to cringe for the historian's nightmare. I'd have rather preferred the stark and shrill chords of the violin to accompany words that dwelt on the creeping fear and claustrophobic sensation caused by the ghost. There are two types of storytelling. One takes pride in establishing a strong connection between the speaker and their audience, making them feel as if a friend was sharing a first-hand experience. The other is a form of narration that comes from a character, rather than a real person, and might display fabricated features. In choosing this second option, Adam Z. Robinson might have missed a real chance to engross and immerse his listeners.